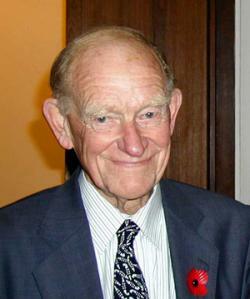 Sir John Crofton, the world famous expert on the treatment of tuberculosis has died in Edinburgh at the age of 97. John Crofton was born in Dublin in 1912, the son of a doctor. His earliest recollection was of hearing the bullets hitting the ceiling of his nursery in the Easter Rebellion in 1916. He was educated at Tunbridge School and proceeded to Cambridge University and St Thomas’s Hospital in London, qualifying in medicine in 1936. He served in the Royal Army Medical Corps from 1939-45 in France, the Middle East and Germany. He was mentioned in Despatches in 1941 and finally attained the rank of Lt Colonel. His experience in typhus was the subject of his MD thesis in 1946. Following demobilisation he worked with Guy Scadding at the Brompton Hospital who recruited him to one of the first clinical trials of the antibiotic streptomycin when he experienced the early benefits of chemotherapy and the disasters which attended the subsequent appearance of drug resistant organisms. In 1951 he moved to Edinburgh as Professor of Respiratory Diseases and Tuberculosis. In 1951 the first new antibiotics were producing patchy results among more than 50,000 tuberculosis patients in a depressed post-war Britain. While some recovered, many more relapsed and died. Crofton inherited responsibility for 400 tuberculosis beds in three hospitals, with a waiting time for admission of one year. He obtained more beds, negotiated for new Consultant appointments and patiently but persistently unified the system so that within a year of the service operating, the waiting list had disappeared. Crofton was quick to realise that tuberculosis would only be cured by the use of at least two drugs to which the tubercle bacilli had been shown to be sensitive. He led a team of dedicated physicians and bacteriologists to prove that this was so, using streptomycin and para-aminosalicylic acid (PAS). With the introduction of isoniazid, therapy became standardised using the three drugs. Crofton also showed that the treatment was as efficacious when given to out-patients as when given to in-patients, thus reducing the demand for in-patient beds. With the use of appropriate chemotherapy the number of resistant organisms declined rapidly and mortality and notification rates fell more sharply in Edinburgh than in any other centre in the world, and the need for surgical intervention diminished dramatically. The success of the Edinburgh method of treatment was at first greeted with some disbelief but eventually was adopted in 23 European countries and America. Aside from his infectious enthusiasm and his meticulous attention to detail, John Crofton’s other great gift was as an organiser, capable of bringing out the best in others. It was a team effort and he took trouble to involve all his medical, nursing, paramedical and scientific colleagues as well as treating the patient as an individual. He travelled to all continents lecturing, advising and sharing his experience with colleagues and politicians alike. Later it was Crofton too who pioneered the global method now used to fight terrifying new drug-resistant strains requiring ever more complex and expensive cocktails of antibiotics, if indeed they are treatable at all. Following the decline of tuberculosis in Britain, John Crofton’s research activities widened, resulting in publications covering a wide spectrum of respiratory medicine, including co-authorship in a postgraduate book on Respiratory Diseases, now in its fifth edition. Crofton also founded Scotland’s Action on Smoking and Health (ASH) of which his wife, Eileen, was the director. This led, after 30 years of groundwork, to Britain’s first public smoking ban in Scotland. When Michael Bloomberg, Mayor of New York City, wanted to spend 200 million dollars of his own money for the good of developing countries, John Crofton was asked for advice. In reply he told him to fight smoking, focusing on high-incidence countries and funding a major effort in the media, all of which have come to pass. More recently “Tobacco” co-authored by Crofton is a campaigners’ handbook. Despite an intensely active participation in medical research he was Dean of the Faculty of Medicine from 1964-66 and a Vice Principal of the University in 1969-70. He was successively President of the Scottish Thoracic Society, the British Thoracic Association and the Thoracic Society. He was also an adviser to the World Health Organisation on tuberculosis and he served on a number of national scientific and advisory committees in relation to higher medical training and the future of respiratory services. He was President of the Royal College of Physicians of Edinburgh from 1973 to 1976. In recognition of his distinguished contribution to the management of tuberculosis and to medicine he was knighted in 1977, the year of his retirement. Shortly after retirement he set out for Nepal to advise on tuberculosis, which he continued to do until he was seventy seven. Increasingly John and Eileen Crofton were able to pursue major interests in other health problems of the multiply-deprived. In 1992 John Crofton initiated and co-authored a book on Clinical Tuberculosis aimed principally at developing countries with tuberculosis problems. This met with outstanding success with 22 languages in many countries. John Crofton was the recipient of many awards and honours in Britain and worldwide including the gold medal of the British Thoracic Society and the gold medal of the International Union Against Tuberculosis and Lung Diseases.. The most recent of these was the Edwin Chadwick medal in 2008 for outstanding contributions to the advancement of public health. Among the successes of respiratory medicine during the past half century, the control of tuberculosis would clearly head the list. John Crofton’s pre-eminent contributions to this success as innovator, researcher and teacher, will remain an inspiration for those who follow in this field in the future. John’s special leisure activity was hill climbing which he enjoyed well past retirement age. Right to the end the enthusiasm which characterised his life’s work never waned. He leaves a wife, Eileen, five children one of whom is a Consultant Physician, eleven grandchildren and two great grandchildren. I got to know Sir John during my courses of study in Edinburgh more specifically in 1956 but off and on there on till 1958. I did not have a personal contact with him but he was most likeable and accessible amongst the luminaries in the medical field in Edinburgh of that time. His teaching was a rare demonstration of erudition based on a clarity of thought, directness and intellectual honesty, self analytical, self critical and open to discussion. Had I not been wedded to Neurology since my early medical career, I would have followed Sir John's footsteps. It is heart breaking to be loosing the old stalwarts of Medicine with the newer ones having different attitudes towards life forced by a changing world. I did not know about John's death. He was a true pioneer and a man of the highest probity. Sorry to know the sad news of the death of Sir John Crofton, he was really great and his knowledge and students will keep him with us as an enlighted spot in the history of medicine and chest diseases in particular. God bless his soul. It is sad to know about Sir John's unfortunate demise. I pray for peace for the departed soul. His great contributions will guide us in the future. I am sorry to hear of the sad demise of Sir John Crofton, a man who had contributed enormously to medical research. May his soul rest in peace. I know of Sir John Crofton's impact and am saddened to hear of his passing as well. I am equally saddened to know the death of Sir John Crofton, one of the greatest UK physicians of the 20th century and one of the most eminent Presidents of RCP. I had the opportunity to learn from him many years ago. My condolences to the family of Sir John Crofton. Dr Dinesh Nair MRCP also sends his condolences. As we all have experienced the somewhat spooky coincidence of thinking about a patient or someone long distanced that you wonder 'how they are going' only to have them turn up or someone inform you as to their status. I have not thought about Sir John Crofton for some 40 years until last week when I was cleaning out some medical books and wondered how he and Dr Douglas (Crofton and Douglas) were. One of them was kind enough to lend me his cricket boots which unfortunately caused the fracture of the nasal bones of Edinburgh's only on-call ENT Registrar that weekend (it was a 'Bouncer' from me but John's boots helped). Ah well - the way of all flesh. He was a charming gentleman and 40 odd years have not dimmed my appreciation of both his kindness and his help in trying to inculcate some basics into this rather dull brain. I am saddened but I thank you for the news. I, and more particularly my wife Jean, were sorry to learn of Sir John's death. I know how much you admired him. I only met him personally a couple of times (in the early days of the College's moves to reduce alcohol harm), but after Gordon's Leitch’s death he made a point of visiting Jean regularly for several years. Clearly a remarkable figure at a personal as well as an international level. I am saddened to hear about demise of Prof Crofton. I received my FRCPEd. scroll from him at a specially arranged occasion since I could not come during convocation. During his presidentship he visited Chennai known as Madras when he unfortunately had an acute cardiac problem, which resolved well with treatment here at Madras medical college hospital. Sir John's enormous impact on improving services for the care of patients and multisdisciplinary approach are a testimony to all the great hallmarks of medical leadership. Are there thoughts of raising funding for an endowed College lecture and medal (perhaps biennial) for a physician whose work has had national or international impact on any branch of medicine in Sir John's memory. Sorry to hear of the demise of Prof Crofton. We all benefited from his great book. Please accept my condolences to the College regarding the death of Sir John Crofton. We wish that such a person (and all of us) could live forever. On behalf of my colleagues and myself, I convey deep condolences on the very sad demise of Sir John Crofton which is a great loss indeed to physicians all over the world. The medical profession will continue to benefit from his pioneer publications. May Allah gives strength to his bereaved family to bear the grief. Having spent three years as a senior registrar at the city Hospital in 1968-71 I have very fond memories of Sir John Crofton. He was a great teacher and a delightful and humble man to work under. I treasure his inscription in the first edition of Respiratory Diseases which came out while I was at the City Hospital. Many others, I am sure, will also wish to add their tributes to one of the worlds great and farseeing Physicians.